Shepherd representatives, Stephen Taylor, Christelle Marotel, Greg Ramminger and Rob Hart are attending the Fraunhofer Airbag Symposium Nov. 26-28, in Mannheim, Germany. 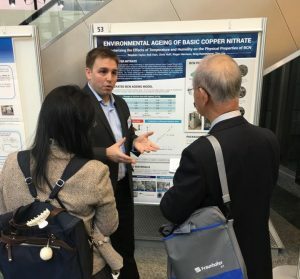 Stephen will be presenting a poster titled “Environmental Ageing of Basic Copper Nitrate,” which covers Shepherd’s latest work to understand and control the natural coarsening of Basic Copper Nitrate (BCN) particles with time. Shepherd Chemical will consolidate our position as the leaders in making consistent and high-quality BCN while we address emerging concerns in the inflator world about the long-term stability of generant formulations. Highly specialized pyrotechnic generants in the automotive industry provide lifesaving airbag technology for more than 5 million people involved in traffic accidents each year. Shepherd has over 20 years of experience in developing and producing chemicals for the pyrotechnic generant space. Click here to learn more or to download the poster.